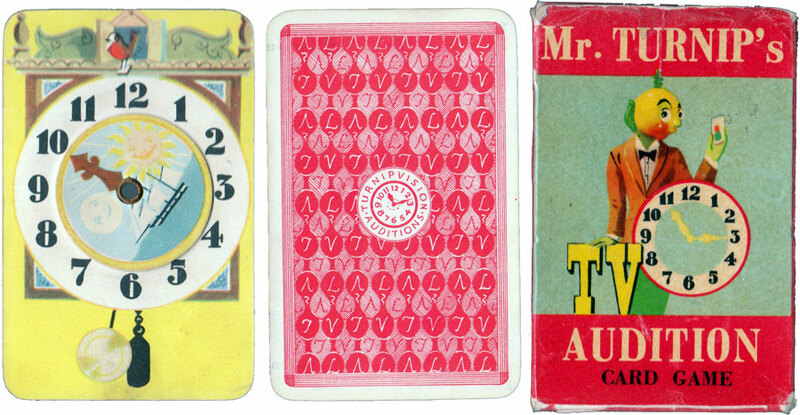 Above: extra card, reverse and box from Mr Turnip’s TV Audition Card Game published by Ariel Productions Ltd., 1954. In 1950 the BBC’s Children’s TV Department introduced a magazine programme called “Whirligig”. The host was Humphrey Lestocq, the original “Flying Officer Kite” of comedy sketch fame, who was known as “HL” in the programme. His catch phrase was “goody, goody gum drops”. Mr Turnip was a puppet character that was very bossy and constantly getting the better of HL. He was invented by Joy Laurey and his voice was provided by Peter Hawkins. This man was the main provider of comic voices for children’s TV in the 1950’s and 1960’s. He was the voice of The Flowerpot Men, Captain Pugwash and an early Dalek among many others. Whirligig ran until 1956, so the card game was probably produced around 1953 or so. 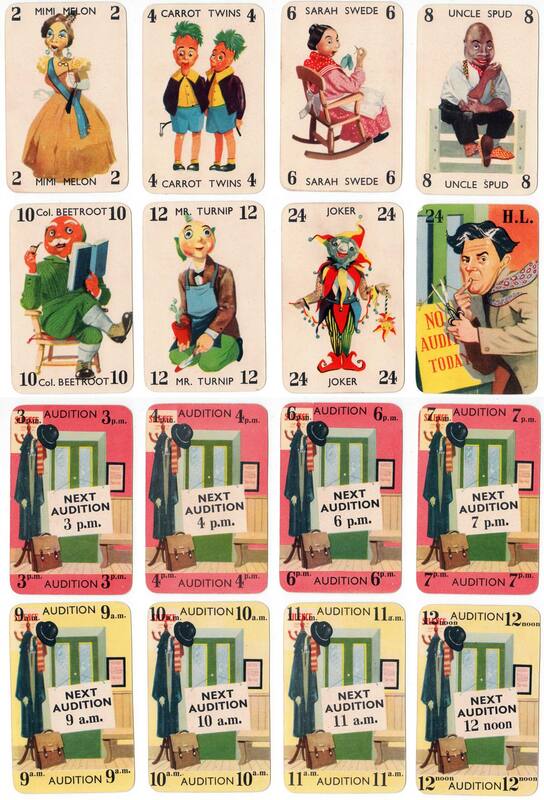 Above: Mr Turnip’s TV Audition Card Game published by Ariel Productions Ltd., 1954. Images and notes courtesy Rex Pitts.